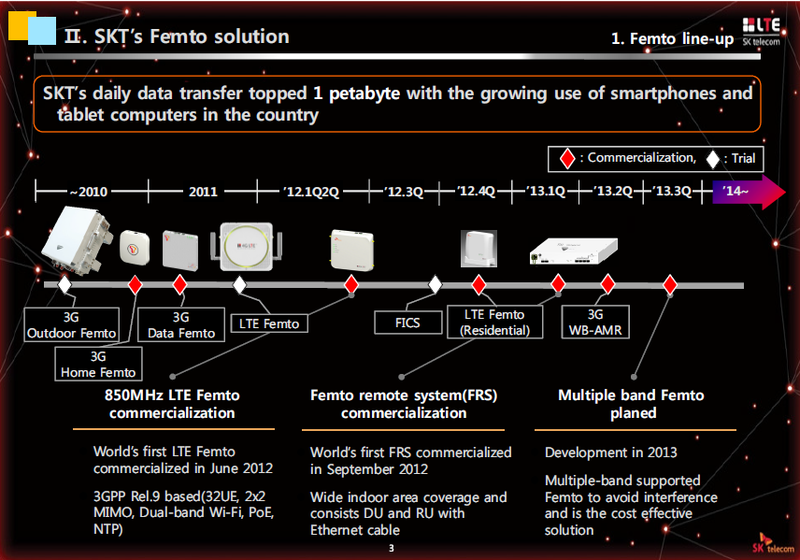 Japanese operator, NTT Docomo recently published some more details about its Xi Femtocell service. The Femtocell is a dual mode LTE-WCDMA femtocell. WCDMA is mainly used as a CS Fallback option when used with LTE device. In this case if the WCDMA part stops working for some reason then depending on the macro availability, it may hand the UE back to Macro or just keep using the LTE only service. I could not completely figure out but it also looks like the Femtocell operates in co-channel with the Macro. During the power on, SON algorithms device the codes, the power of the femtocell, etc. 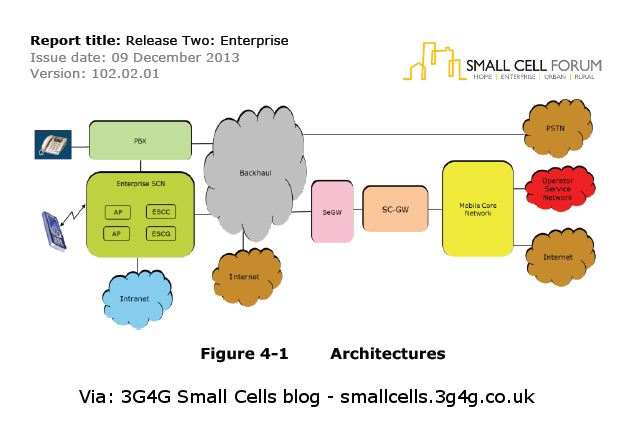 The long awaited "Release Two" from the Small Cell Forum is finally here. Gordon Mansfield is explaining this Release two in the video above. There is a good summary of this Release on ThinkSmallCell and TMN. Definitely worth a read. 3GPP member companies have decided to take the Small Cells vs WiFi fight back into the Wi-Fi camp by unveiling the initiative to have LTE in the unlicensed band (officially known as LTE-U but another interesting term uLTEA has been proposed unofficially too). Qualcomm has launched a radical initiative to deploy LTE Advanced in the unlicensed 5GHz band, which has traditionally been the preserve of Wi-Fi devices. If the initiative gains support, it could be a hammer blow to carrier Wi-Fi, though Qualcomm says it is still a strong supporter of all types of Wi-Fi, given its Qualcomm Atheros division, which is a leading producer of Wi-Fi chipsets. Qualcomm CEO Paul Jacobs unveiled the company’s initiative for LTE Advanced in unlicensed spectrum at its financial-analyst day in New York on Nov. 20. It was interesting timing, considering that the main annual carrier Wi-Fi event, the Wireless Broadband Alliance’s Wi-Fi Global Congress, was taking place on the same day on the other side of the world, in Beijing. The chipset giant followed the announcement by its CEO with detailed presentations on the initiative at Informa’s LTE North America event in Dallas on Nov. 21-22. 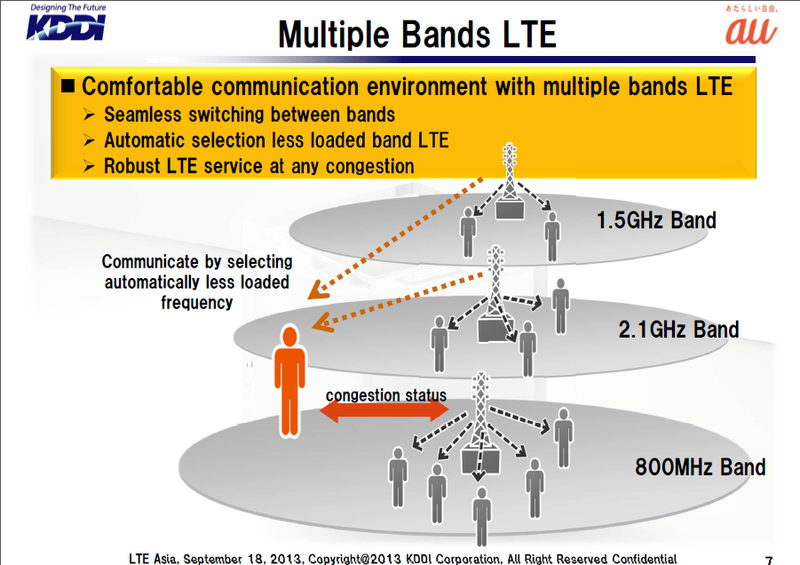 The essence of Qualcomm’s proposal is that it is complicated to integrate LTE and Wi-Fi to create carrier Wi-Fi, so a better option could be to use LTE Advanced to extend LTE into unlicensed spectrum, thus eliminating the need for Wi-Fi in that context....So how does Qualcomm plan to square this circle and offer reliable mobile services in unreliable unlicensed spectrum? By using LTE Advanced to create a hybrid system operating in both licensed and unlicensed spectrum at the same time. 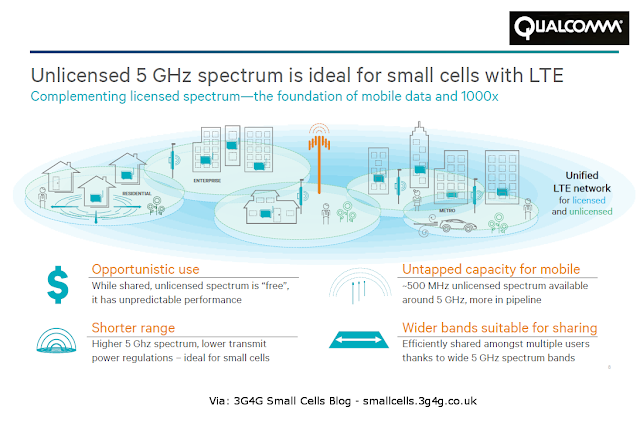 Specifically, Qualcomm is proposing a system that uses the carrier-aggregation (CA) feature of LTE Advanced to aggregate licensed LTE spectrum with unlicensed spectrum in the 5GHz band. The unlicensed spectrum, which would be aggregated with licensed spectrum on the downlink only, would only be used for data services. The licensed spectrum would be used for uplink and downlink and would support network control as well as voice and data services. Given the power limits placed on devices using the unlicensed 5GHz band, uLTEA would be used mainly in small cells, similar to Wi-Fi. Qualcomm has recently floated the idea of deploying LTE in unlicensed bands, particularly focusing on the 5GHz band, which is currently used mostly for WiFi. 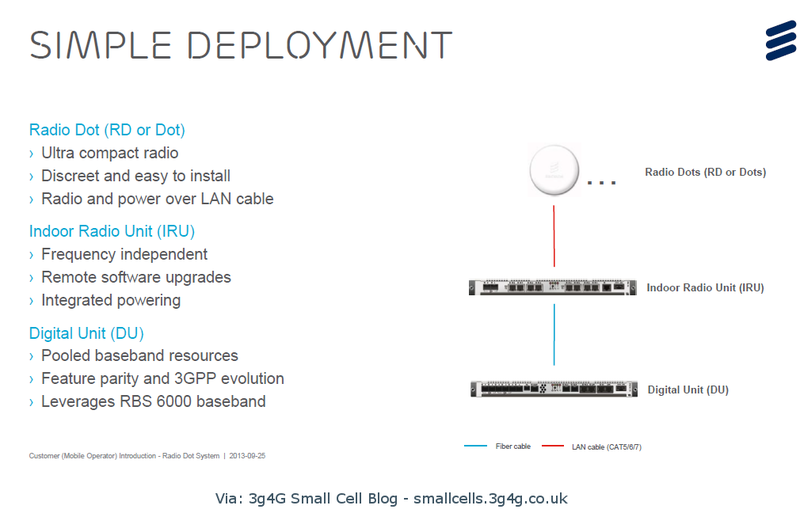 According to a document (RP-131635) submitted to the upcoming 3GPP plenary meeting, the proposal is to deploy LTE as Supplemental Downlink (SDL) in 5725-5850 MHz in USA, with the PCell (Primary Cell) always operating on a carrier in a licensed band. Verizon has also submitted a Work Item Proposal (RP-131680) to to introduce the new band for SDL usage. There’s also a Study Item proposal from Ericsson (RP-131788) is the rapporteur to study the modifications necessary to the LTE radio. One of the big issue (though small cell vendors often play it down) that has been delaying the rollout of Small Cells has been interference management in co-channel deployment cases. 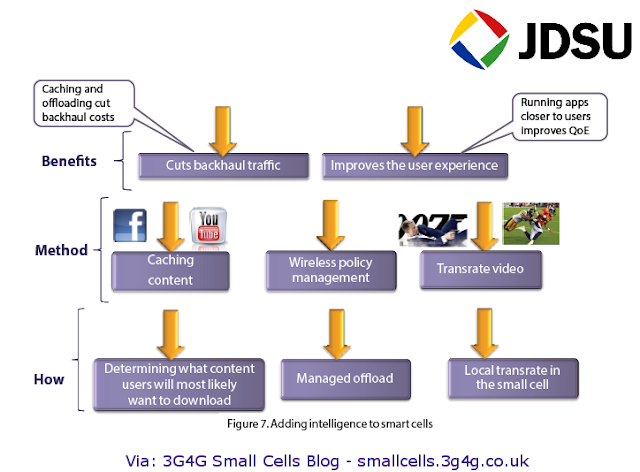 The operators are worried about ad-hoc small cells creating interference with the properly planned and optimized Macro cells (though in practice its not as bad as they think it is). With LTE-U, this issue can be put to rest. 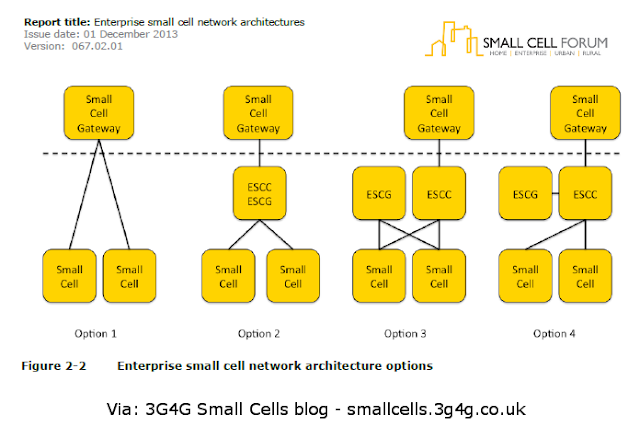 I can see LTE-U, if adopted, can also help create new business models around Small cells. 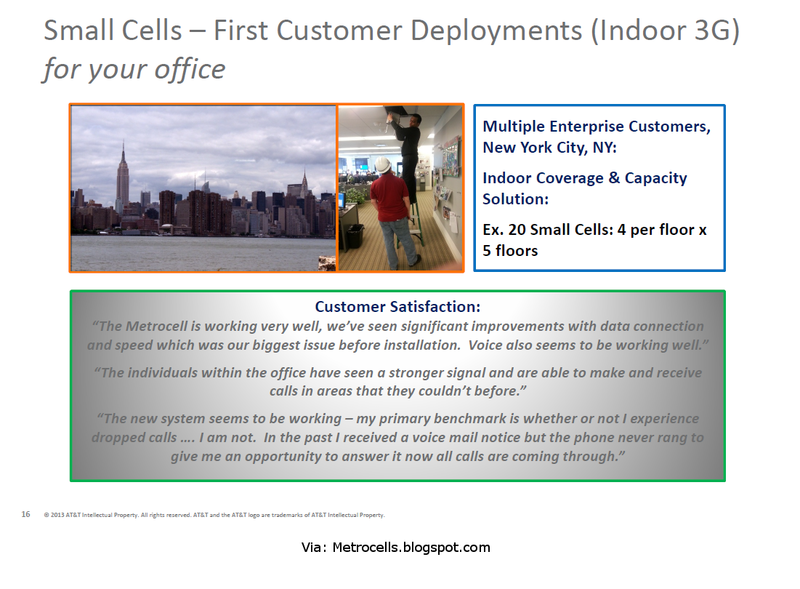 Neutral Small cells, deployed in the hotspots like stadiums, shopping malls, etc. can serve users of all networks. 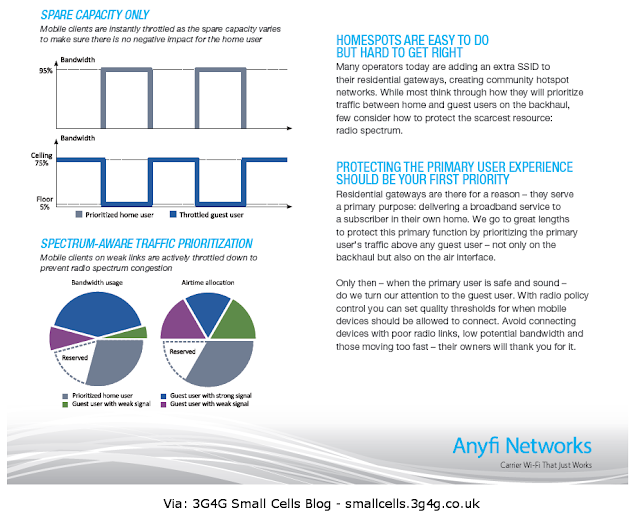 The signalling can take care of each user connecting to its own network using backhaul. Femto as a Service (FaaS) and Small Cells as a Service (SCaaS) would probably become a common approach as there would be no concerns about which spectrum is being used. There would be a small concern about interference between Wi-Fi and Small cells. Most of the existing Wi-Fi and other devices that use unlicensed spectrum use the 2.4GHz band with a few using 5GHz band now. If LTE-U uses the 'Listen Before Talk' approach, other technologies can be enhanced to probably do the same. Another thing worth remembering is that there is nearly 300MHz of spectrum in 5GHz band available universally. In certain countries the available spectrum can be as much as 500MHz. 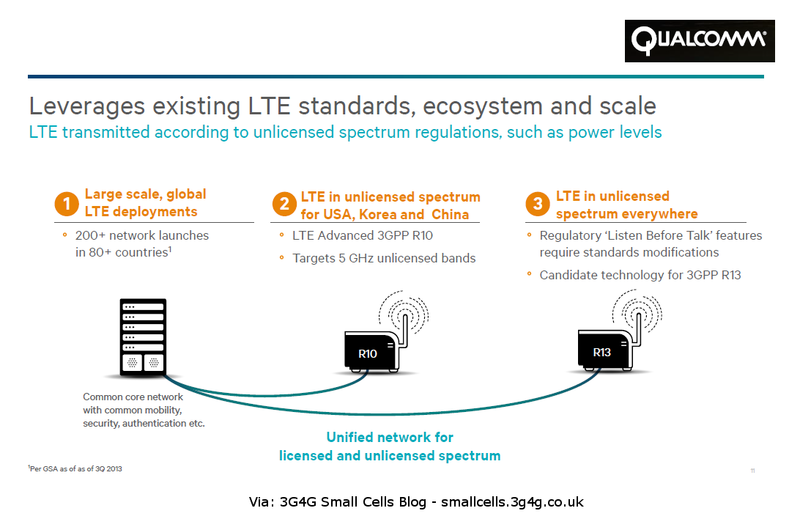 This should be enough for LTE-U as well as other technologies in the unlicensed spectrum. Consider Republic Wireless, a Raleigh-based business that announced this month it would sell Motorola's new flagship phone, the Moto X. Republic enjoys all the traditional advantages of an MVNO — low capital expenditures on infrastructure and spectrum — but it's taken the additional step of cutting out 3G and 4G data use whenever it can. Technically, Republic operates on Sprint's network, but it's more appropriate to think of Sprint as a backup for when a call or message can't be completed over WiFi. Yes, you read that right: WiFi. Republic's business depends on shunting all of your communications — data, voice, everything — onto the free stuff you get in your office or in coffee shops. What makes this beautiful is that whenever a Republic customer chooses to place a call over WiFi, that saves Republic money. As a result, Republic can offer a $5-a-month plan for unlimited talk, text and data. For another $5 a month, customers get access to Sprint's cellular network (minus 3G). Higher-tier plans provide 3G and 4G Internet on Sprint, though it's almost a joke to call them "higher-tier" when the most expensive plan tops out at just $40 a month. The tiered plan supersedes an old, $19-a-month all-you-can-eat plan. "The crazy plans at $5 and $10 have never been tried," said CEO David Morken. "That's because we focus on unlicensed spectrum as the primary, and licensed spectrum as the secondary." This approach can be quite disruptive for the MNO's. With NGH / HS2, soon MVNO's like republic wireless will be able to offer roaming on WiFi, thereby cutting the costs while not in the home market. WBA released an Industry report recently (embedded below) which had some interesting findings. Industry bodies, vendors and device manufacturers are working hard to get rid of some of these limitations and barriers. 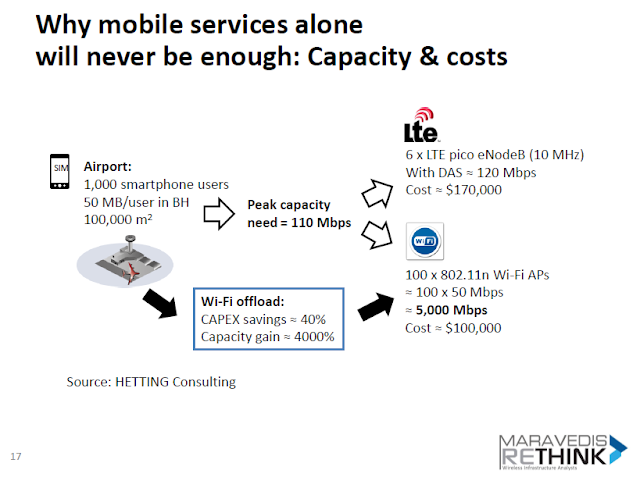 Once these limitations are gone, there is going to be a good business case for offering of global Wi-Fi roaming for example. Another interesting question in the survey was what would be your preferred means of building Wi-Fi footprint. One of the answers is shown above, a similar question was asked in a webinar and posted in the 3G4G blog post here. Finally, since the WBA report mentions about Wi-Fi and Small cells data offload, you may find a previous post of interest here. This looks very interesting and similar to some other concepts that I have discussed on 3G4G blog. One of them is the Multi-stream Aggregation (MSA) that allows aggregation of data from different radio access technologies. Another is the Phantom Cell concept, proposed by NTT Docomo, where control plane is handles by one cell and data by another. 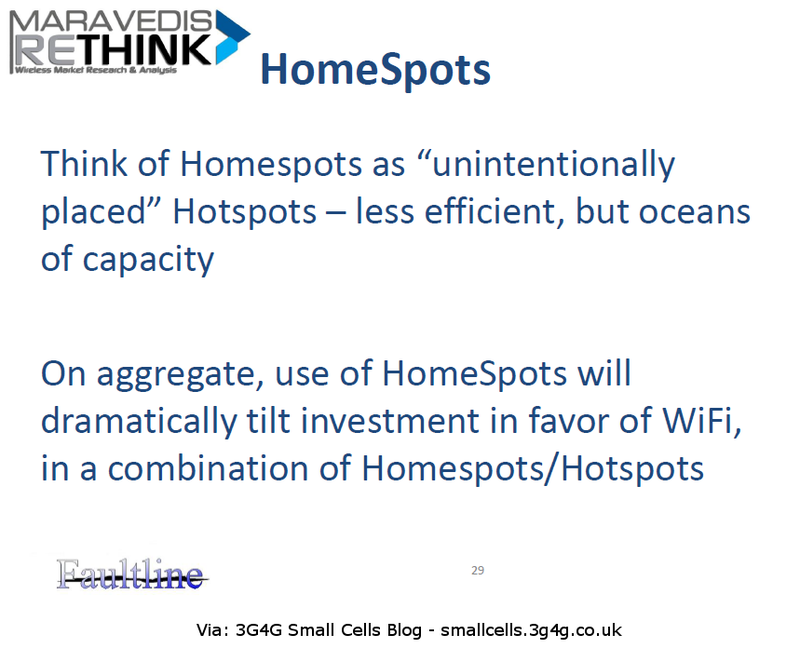 Small cells would generally do only data or larger cells would do control plane. Of course you can have different combinations as can be seen in the picture above. This also reminds me of the earlier post about Super Macros. Is this SUPER cell a Phase 2 of the Super Macro kind of architecture? Or is it just a future 5G concept? Please feel free to add your comments. 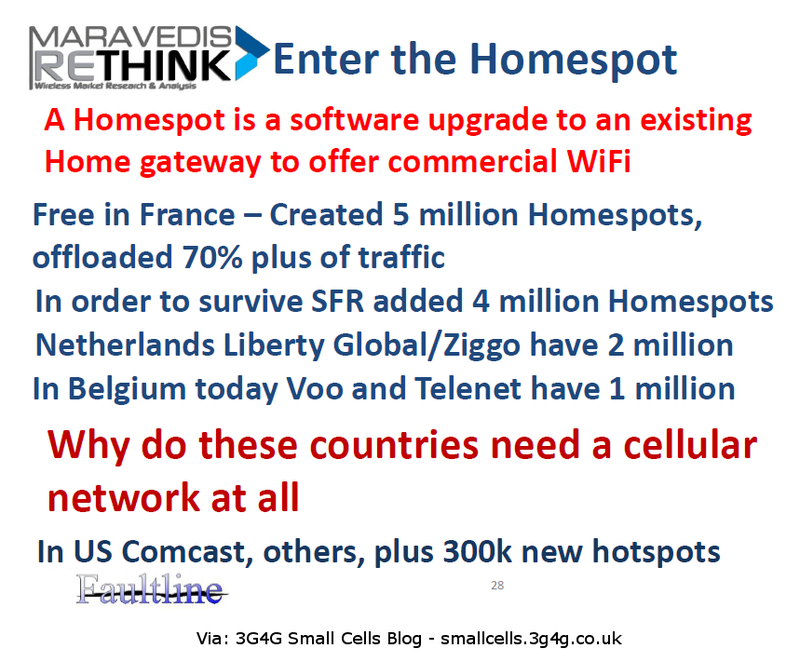 In UK we have BT FON and Openzone which are both Wi-Fi hotspot services. Openzone is actually a hotspot deployed and maintained by them while FON is actually a Homespot, which uses spare capacity from the open Home Hubs deployed in the homes. BT has some details about it here. 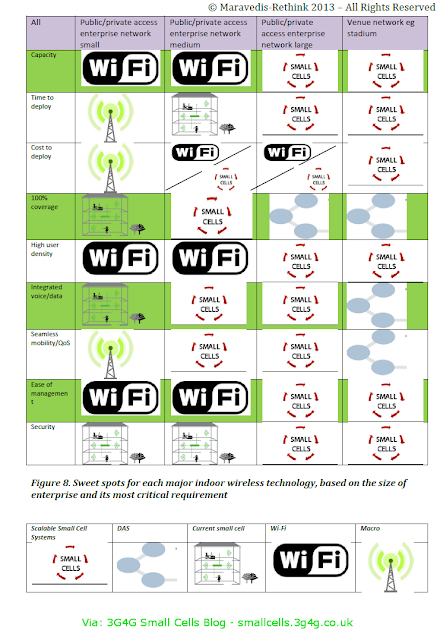 Anyfi whitepaper shows (see above pic) some of the technical challenges that need to be kept in mind while deploying Homespots. 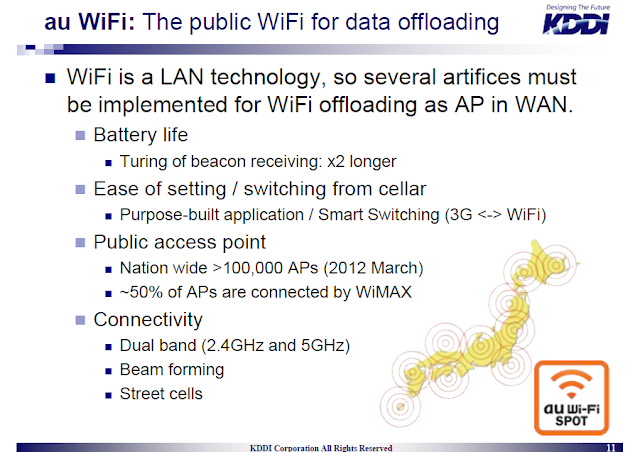 While going through some KDDI presentations, came across how they planned and perform Offloading. 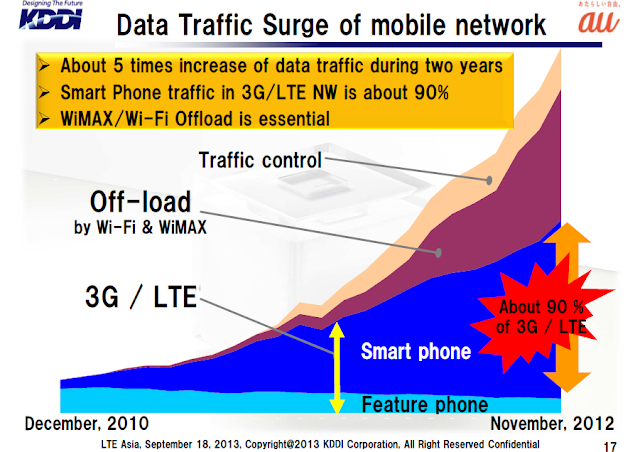 In fact, even before the deployment of LTE, they were aware that the network capacity would not be enough for the savvy Japanese mobile phone users. They had to start planning for how to offload the users as soon as possible. au Wi-Fi is their Wi-Fi offloading strategy where they make Wi-Fi hotspots available for the users. They even claim that with Wi-Fi on, the baattery life could be 1.5 times the normal 3G battery life. UQ WiMAX is another KDDI company that allows users with compatible handsets to offload to WiMAX. 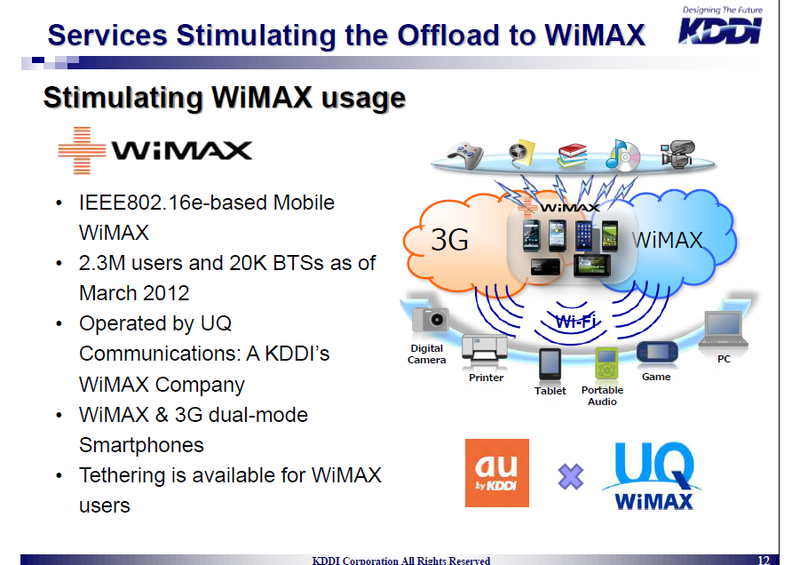 KDDI have their own WiMAX branded services as well, see here. Finally, with the LTE rollout they have different hierarchical cells available that the user could be moved to if one of the layers is congested. 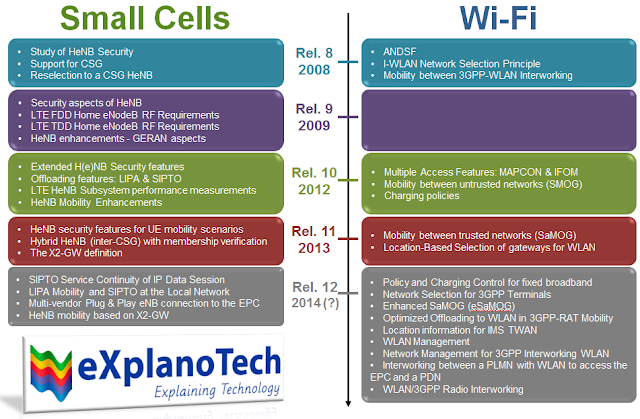 Here is a quick chart of features of Small Cells and Wi-Fi introduced by 3GPP in different releases. Please feel free to suggest anything that has been missed out. Came across a whitepaper from JDSU, not so new but its got some interesting stuff. In an earlier post here, we saw the challenges for small cells deployment, the picture above shows another view. 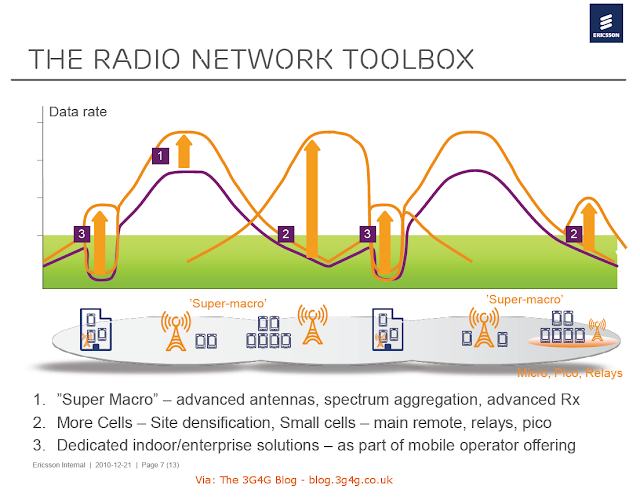 UK operator EE wants to turn its existing macro cell sites into "super macros," according to Andy Sutton, the carrier's principal network architect, speaking at the recent Base Station conference in London. 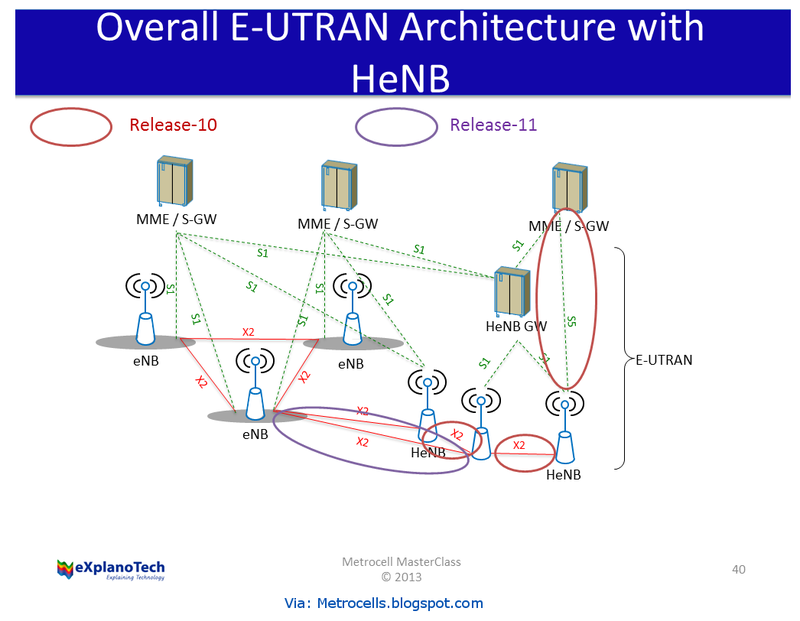 EE 's plan to super size its macro cell sites fits in to a broader Heterogeneous Network (HetNet) strategy for adding capacity and extending coverage. The operator rolled out the first LTE network in the UK last year, and has now covered 55 percent of the UK population and has 1 million 4G customers. 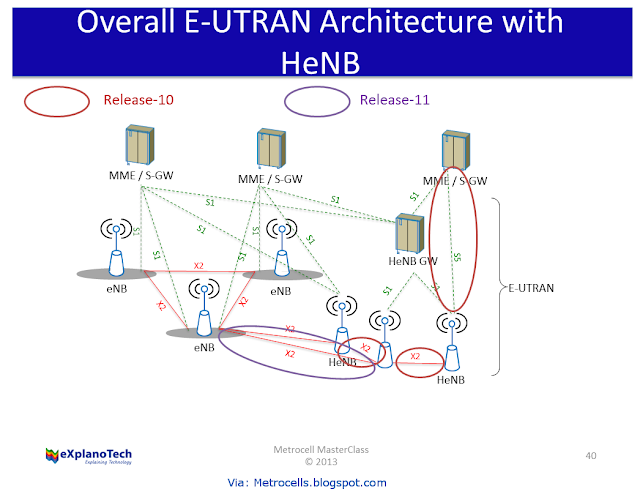 "Super macro is the first step toward building a HetNet,” said Sutton. “Evolving the macro is the most cost-optimized way to adding capacity into our networks." But what makes a macro super? According to Sutton, a super macro would typically have multiple radio access technologies (RAT), three-to-six base station sectors, and operate in multiple frequency bands using carrier aggregation techniques. It could be a standalone base station or a hub for subtended, smaller micro cells. He added that infrastructure sharing is vital to the strategy as well. Once the operator has sufficiently beefed up its macro cell sites, then it can look to smaller cells to be deployed indoors and outdoors in hotspots or cell edge locations. 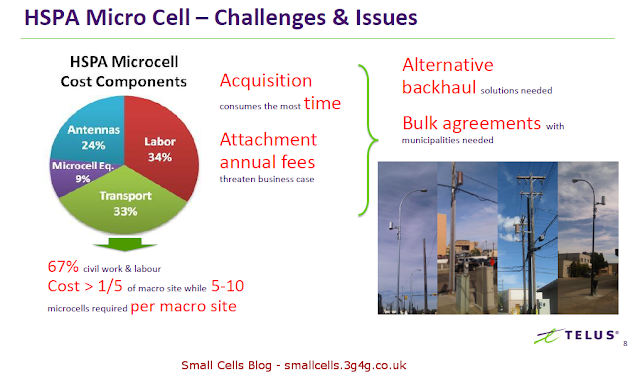 Sutton described a small cell deployment as an "underlay" to the super macro. The term super macro isn't exactly new, but the fact that operators are talking about it now indicates just how much more they are looking to do with their existing radio access network (RAN) infrastructure before introducing new small cells or while planning a small cell deployment. "Within the super macro concept, there's quite a lot operators can do to improve performance," says Heavy Reading senior analyst Gabriel Brown. Along with adding sectors, using more spectrum bands, or employing carrier aggregation, Brown also includes in the super macro concept using 4x4 and 8x8 MIMO, active antenna systems, vertical sectorization, or beamforming. The advantage of improving macro sites is that many of the basic elements that go into the total cost of ownership of a cell site are already in place, such as power, real estate rental, and backhaul, according to Brown. Ericsson Radio Dot System is compact and offers flexible mounting. The device weighs 300 grams, is the result of two years of research and development, and incorporates 14 patents. It introduces a revolutionary antenna element, or "dot," which delivers mobile broadband access to users. Because of its convenient size, scalability, and compelling evolution path, this product caters to different kinds of users in medium to large indoor locations, and aims to address operators' needs of offering a complete indoor solution. Dots are connected and powered via standard internet LAN cables (Category 5/6/7) to indoor radio units that link to a base station. Radio Dot System leverages the same industry-leading features found in Ericsson's macro base station. Deployments and upgrades are simple, addressing growing capacity and coverage requirements. Thus the users' experience is consistent wherever they go and the indoor network evolves in lockstep with the outdoor network. Ericsson Radio Dot System supports integration with Ericsson's carrier Wi-Fi portfolio enabling features such as real-time traffic steering to ensure the best user experience across both Wi-Fi and 3GPP networks. A related patent by E///, on how they may be transporting digital I&Q (essentially CPRI) between RadioDot and IRU by introducing APL. 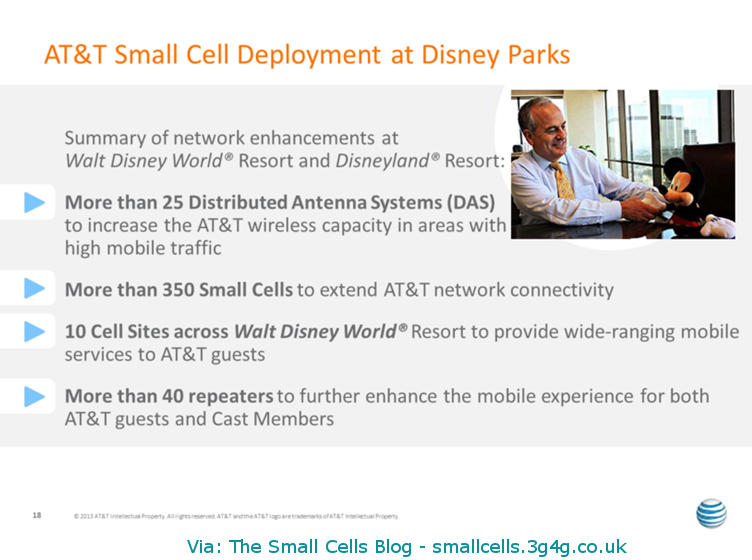 Slightly old news but I did hear Jim Parker, Senior Manager, Antenna Solutions group at AT&T talking about metrocells and their deployments in the Disney parks. AT&T will add more than 25 distributed antenna systems in an effort to add capacity. 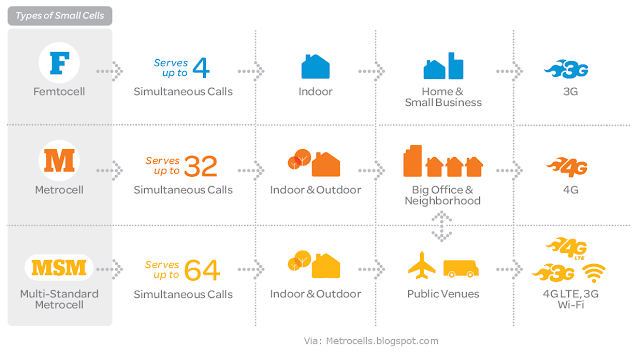 It will also add more than 350 small cells, which extend the availability of the network. AT&T is adding 10 new cell sites across the Walt Disney World resort to boost coverage and capacity. And it will add nearly 50 repeaters to help improve coverage of the network. Chris Hill, AT&T's senior vice president for advanced solutions, said that AT&T's efforts to improve coverage in an around Disney resorts is part of a bigger effort the company is making to add capacity and improve coverage in highly trafficked areas. He said that even though AT&T had decent network coverage already within the Disney parks, customers often experienced issues in some buildings or in remote reaches of the resorts. "The macro cell sites can only cover so much," he said. "So you need to go to small cells to really get everywhere you need to be and to provide the capacity you need in areas with a high density of people." 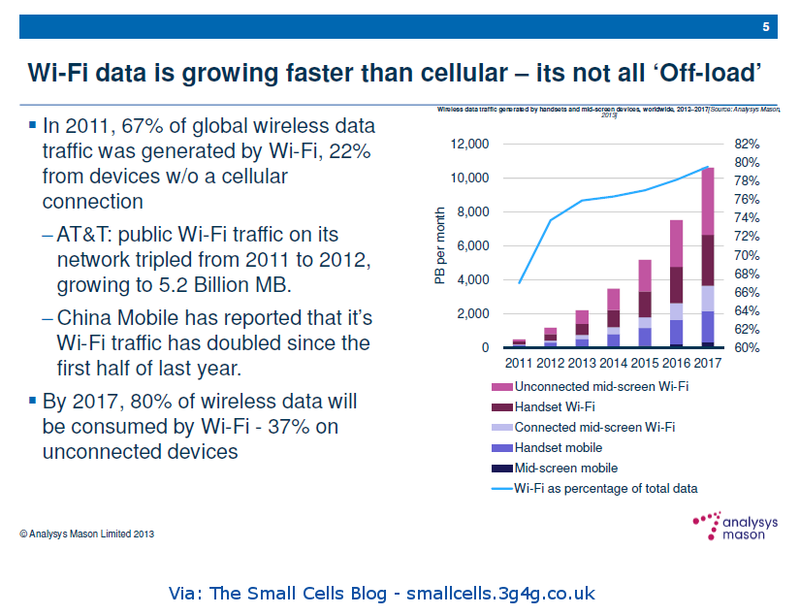 Wi-Fi and Cellular Data - Two sides of the same coin? Going through a presentation from Small Cells World Summit, Analysis Mason argues that all WiFi activity is not just offload / substitution of cellular data but to a lot of extent its addition too. I completely agree as I think that once users get used to using data on their devices, they are more comfortable in using much more data over WiFi. Of course here I am assuming carrier or public WiFi rather than what is privately used at home or in the office. To a lot of extent this use of data is encouraged by the operators and the newer and more efficient technologies. Once a 100MB data cap was more than enough for most users while now, most users struggle with 1GB of data caps. WiFi is always an alternative, especially if the data usage is not counted in the allowance or included at a reduced rate. Deployment in enterprise is a challenging task for the operators but it has many benefits hence this is one of the areas they have been working very hard to get it right. 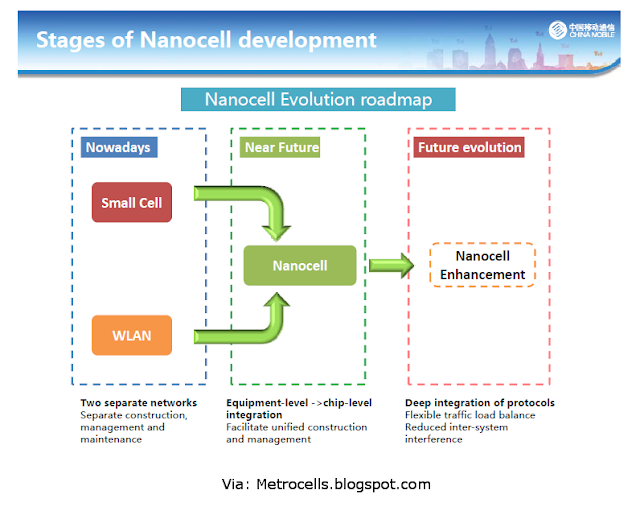 China Mobile prefers to call its Small Cell, Nanocell. I found an interesting summary on this topic from Rupert Baines in the OSP Magazine, some of this information is copied below. WiFi & Cellular: True Love or Arranged Marriage? 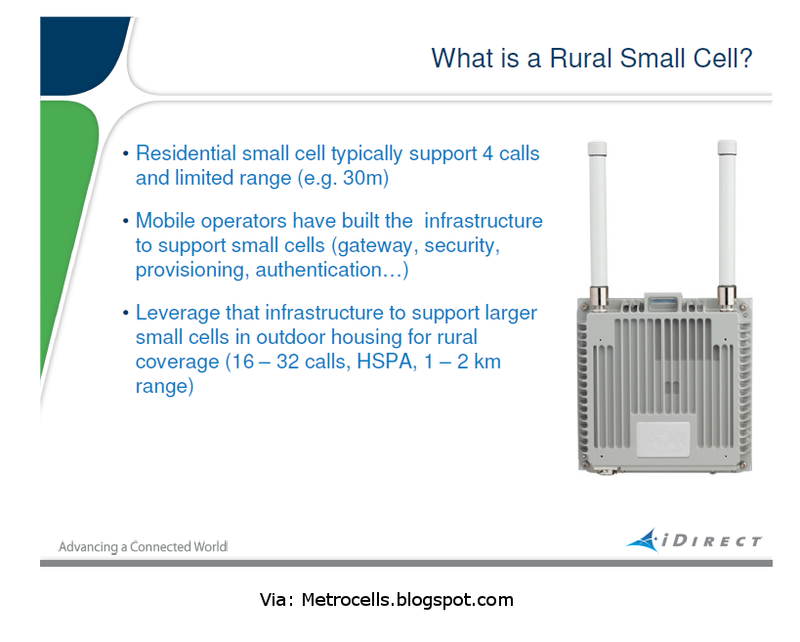 A typical problem with the rural small cells is how to power and backhaul them. Power issue can be solved using Solar cells, wind turbines, etc. and generally a combination of them as a failsafe mechanism but what about the backhaul. We had a discussion earlier on 'dedicated v/s shared' carrier here. This post is just re-iterating the fact that while in case of LTE, there are advanced techniques like eICIC to manage interference (see 3G4G blog here), in case of 3G there are no standard techniques to manage the interference in case of shared carrier. 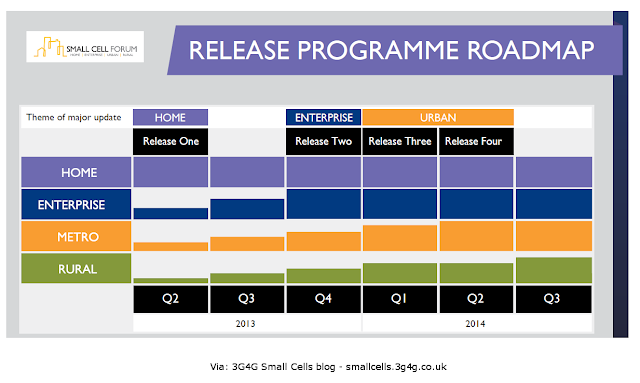 A simple picture showing the Small Cells support in different 3GPP releases. For more details refer to the 3G4G blog here. 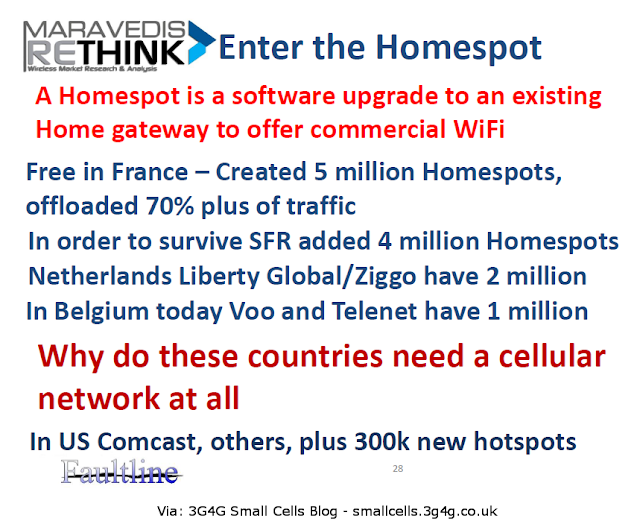 From a presentation by Gordon Mansfield, in the Small Cells World Summit 2013. What do the customers think? 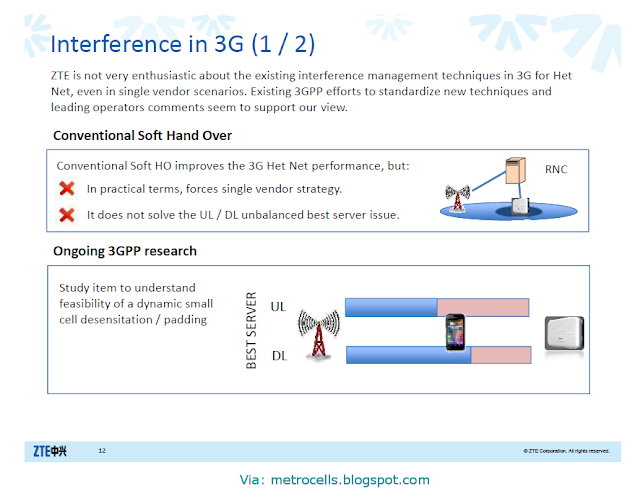 In the Release-8/9 of 3GPP, X2 interface between Small Cells and between Small Cells and Macro cells was not available. In Release-10 and 11, this was made available as shown in the picture above. X2 is not only useful for lossless handovers in LTE/LTE-A but is also very useful for Interference management using eICIC (enhanced Inter Cell Interference Management) feature introduced in Rel-10. More details on this enhancement is available in 3GPP TS 36.300 here. #SCWS2013 Mexican prisons use jammers to block prisoners making calls. This jamming bleeds outside the prison grounds causing problems! Here is a link about the Mexican prison jammers blocking neighbours cellular service. Currently, China’s urban construction is in full swing, and its mobile network coverage is rising. In the increasingly crowded urban environment, however, ensuring the quality of mobile-network coverage has become a problem. In order to meet this challenge, Ericsson has launched the City Site integrated solution, and successfully applied it to China Mobile’s GSM network in Nanning, Guangxi. 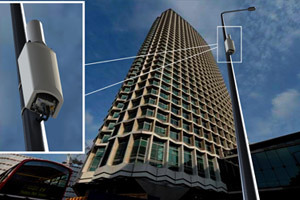 The City Site, which has been deployed with the standard RBS6601 base station, has an integrated Omni Antenna, which only covers a small area and is, therefore, easy to deploy. It could also be launched with just access to power and transmission cables. According to the test of the live network, the City Site has effectively met the capacity and quality needs of network coverage, as well as ensuring excellent user experience. Greentouch believes three key changes will make the difference to cellular networks' power hunger and CO2 emissions levels. These are the use of smaller, low power metrocells to add capacity in dense areas; wider infrastructure sharing; and techniques to match power consumption flexibly to the level of usage of the network at any time. "We need to make resource usage proportional to the amount of traffic the network is handling," said Klein. Smart antenna technologies will also be vital. Greentouch revealed first results of a key low energy project in 2011, demonstrating proof of concept base stations that use large arrays of up to 1,000 smart antennas to cut power consumption. The trial found that the energy needed to power each one dropped significantly as more were added, without impacting the range or capacity of the cell. The team was using fairly standard MIMO techniques, but harnessing the arrays not to boost capacity, but to reinforce a single transmission, creating a single strong beam from many low power signals. A transatlantic technology collaboration between Cambridge Consultants in the UK and Florida-based Airspan Networks is set to enhance speed and capacity over the transformational LTE (long term evolution) platform. 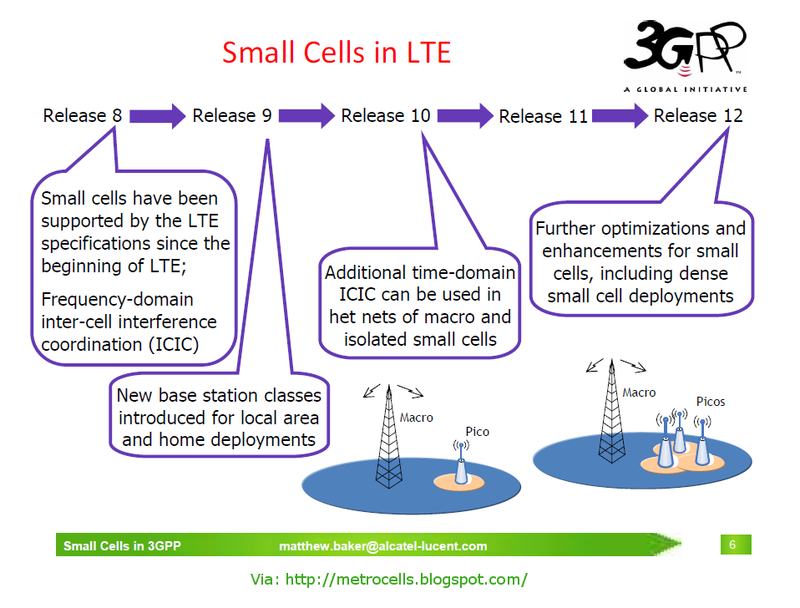 The partners have unveiled an LTE-Advanced metrocell boost for mobile broadband; 4G LTE, is a standard for wireless communication of high-speed data for mobile phones and data terminals. Cambridge Consultants has collaborated with Airspan, a leading vendor of LTE small cells and broadband wireless products and solutions, to boost the data capacity capabilities of the US company’s heterogenous network (HetNet) base stations. ...Deutsche Telekom putting its foot firmly in the Wi-Fi offload camp, and marks a further signal of Wi-Fi's growing importance to operators who seek alternative ways of managing rampant mobile data traffic. "The astonishing increase in data traffic calls for network optimisation and expansion, as well as the implementation of new high-speed networks," said Deutsche Telekom spokesman Dirk Wende, citing comments made by outgoing Deutsche Telekom CEO Rene Obermann. "The partnership with FON fits perfectly with Telekom's network expansion strategy. Wi-Fi and hotspots can be used to divert heavy data traffic to fixed-line networks and thus reduce the load on mobile networks." Deutsche Telekom sees Wi-Fi as complementary to its existing services, and certainly has no plans to blanket Germany (a geographically large country) with its own Wi-Fi hotspots. The carrier is also working on what it calls Multi-Standard Metrocells (MSMs), or small cells that combine LTE, HSPA+ and Wi-Fi into a single unit, but these are apparently proving tricky as the carrier appears to be in no rush to hustle the MSM devices out of the lab and into real-world deployments. "It would be foolish to think less than a year" for the MSM deployments, Mansfield told Light Reading Mobile, but he added the rollout effort probably will not take two years either. Speaking at the Citi Global Internet, Media & Communications Conference held during January in Las Vegas, John Donovan, senior executive vice president of AT&T technology and network operations, emphasized the importance of multi-standard small cells in the operator's network plans. 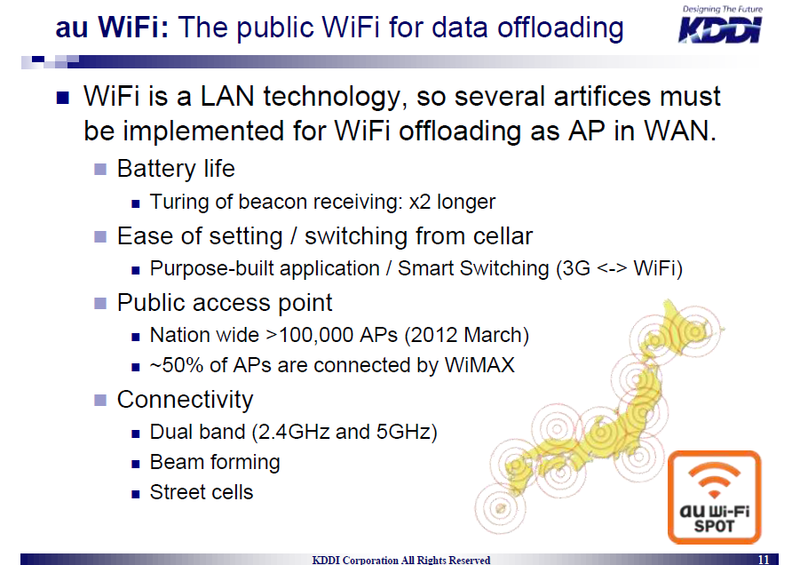 "Our objective for 2014 is that we won't do any small cell or in-building systems that don't include Wi-Fi," he said. AT&T announced last November that it intends to deploy more than 40,000 small cells over the next two years as part of its expansive Project Velocity IP (or VIP). The project also will entail the rollout of 10,000 new macrocells and 1,000 distributed antenna systems (DAS) throughout its service footprint. During AT&T's Innovation Showcase in New York last week, Mansfield indicated that the end-of-2015 target for 40,000 small cells still seems quite feasible. "At this point I see no reason to believe that we won't hit that number...and we could revise it next year," he said. 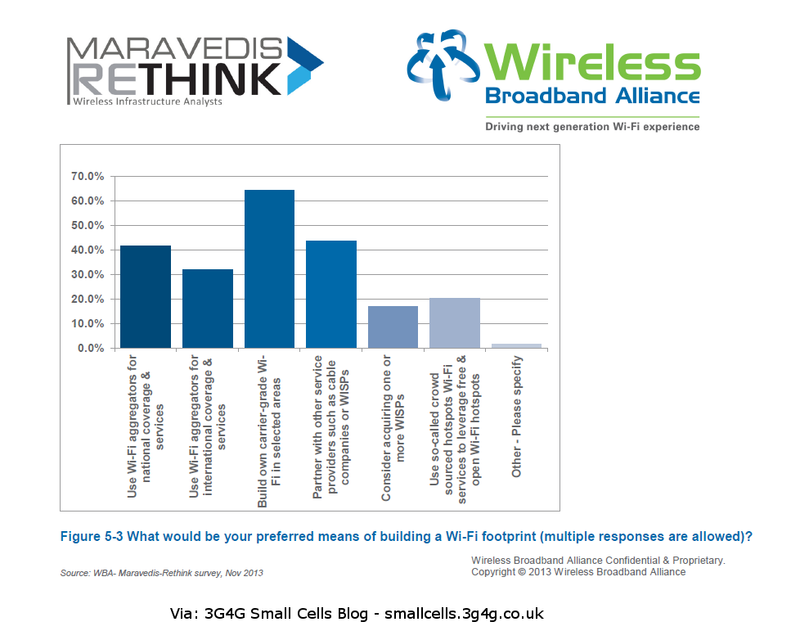 While some people forecast that as many as 80 or 90% of outdoor metrocells will be connected by wireless backhaul, Maravedis-Rethink believes we'll see something closer to today's split in macrocells - about 55% wireless and 45% fiber. Operators will use fiber wherever possible and install short range wireless in the gaps. In some countries, the availability of fiber is far higher than in others, for example in South Korea, China and Japan. Even in the US, where there is plenty of copper, my guess is that operators will try to reuse existing copper lines to reach the nearest fibre point of presence. 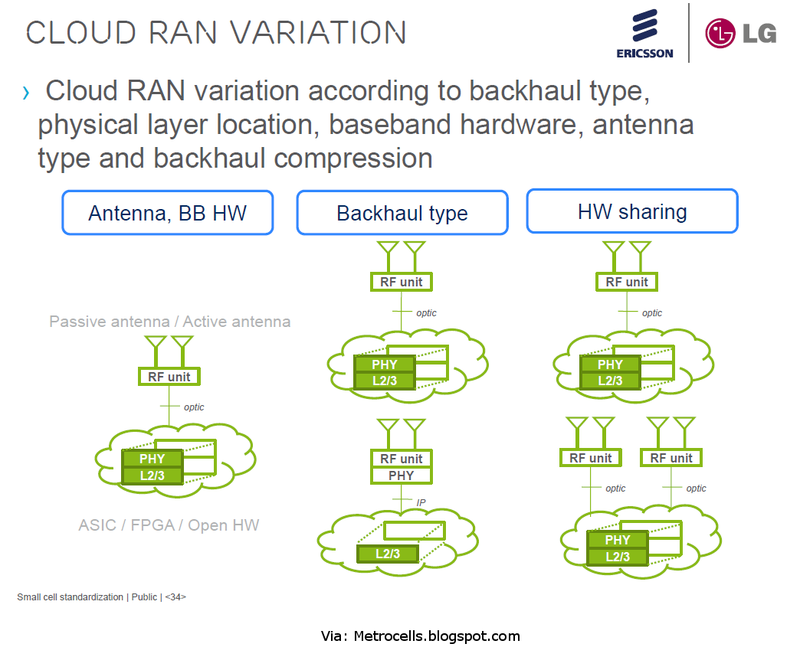 As an analyst, it would be quite easy to be aggressive with high wireless backhaul forecasts, but we have to consider that in reality most operators are very conservative about adopting new technology. 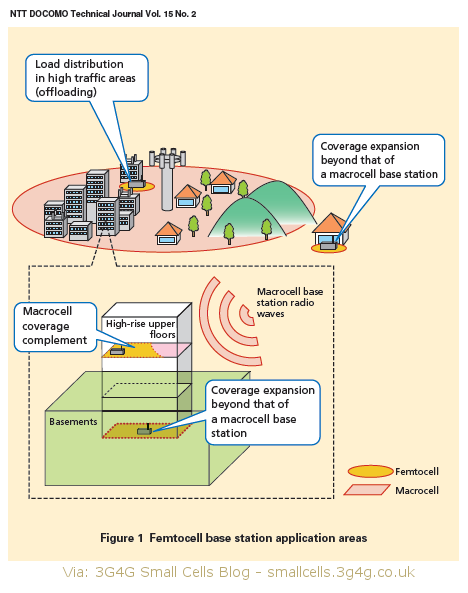 So wireless backhaul may be more important for metrocells than for macrocells, but not excessively so.The most important issue for a metrocell is to offload traffic from the macro network. 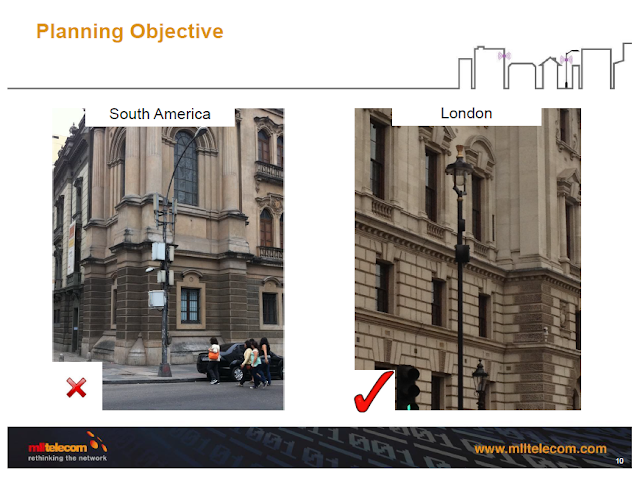 Location is fundamental – the NGMN (Next Generation Mobile Network) Alliance has indicated that cells need to be located within 10 meters of each traffic hotspot – so there really needs to be far more flexibility in backhaul. This is where wireless backhaul becomes more significant. The role that third party players offering ‘small cells as a service’ such as Virgin and Colt can play is also important. The value of street furniture will increase in the coming years. Those who deployed city Wi-Fi in the past (and failed through lack of monetization) have now realised they were getting access to valuable infrastructure. If you get permission for public Wi-Fi and small cell deployment then that could make the service provider Wi-Fi business more interesting. This gives intermediate players like Virgin, who can deal directly with building, real estate and council owners, an important role to isolate network operators from many/multiple negotiations with location owners. This would make it much more convenient for operators to contract through intermediate players than directly themselves. 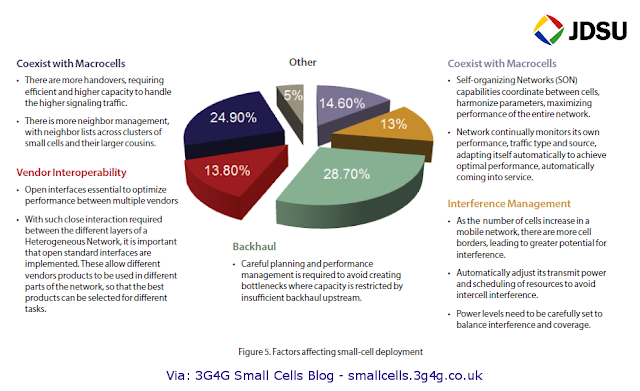 Mobile Experts has released a new Small Cell Market Forecast, predicting more than 5 million metrocells shipped in 2017. Based on weak shipment data during 2012, Mobile Experts predicts slow growth for residential femtocells, at only 12 percent per year. Faster growth will come from capacity upgrades, as mobile operators are pushing hard for high-capacity small cells. The new Mobile Experts forecast predicts that, taken together, outdoor metrocells and indoor capacity nodes will overtake residential femtocell shipments in the 2016 time frame. LAST year, the village of Cranborne was selected as one of 12 communities UK-wide that would participate in a Vodafone pilot project to bring mobile telephone signal to rural “not-spot” areas. Having successfully fulfilled the technical criteria for the trial, which included having no 2G or 3G signal and a sufficiently fast fixed-line broadband connection to support Vodafone’s new Open Femtocell technology, Vodafone engineers visited local businesses and community buildings in the centre of Cranborne to position five Metro Cells, each the size of a home broadband router, to give the best signal cover to the village. The only cost to the trial community is the cost of power to each box. In February the system was successfully installed and, earlier this month, the village celebrated the official launch of the technology. North Dorset MP Robert Walter attended the launch. He said: “I am thrilled the new technology has been successfully installed and that, for the first time, businesses, residents and visitors can make and receive mobile telephone calls from the heart of the village. It is my sincere wish that the experience of these trials helps to deliver more solutions to rural areas affected by signal blackouts. A good example of how Metrocells can solve coverage problem and may also future proof against capacity issues. Are we going to see more of Cloud RAN (C-RAN) in future? Alcatel-Lucent has unveiled a new TD-LTE metro base station for its lightRadio product line that will be deployed by China Mobile, which co-developed it. The compact lightRadio Metro Radio – revealed at this year’s Mobile World Congress in Barcelona – houses two lightRadio cubes, fully integrated with a directional antenna, with an output of 5W. China Mobile will deploy the 2.6 GHz Metro Radio in its TD-LTE network in Shanghai, Nanjing and Qingdao – specifically, in busy indoor and outdoor locations like shopping centers where macro coverage can suffer either from building density or too many people trying to access the network. The Metro Radio is the first product to result from a co-creation agreement signed by Alcatel-Lucent and China Mobile just over a year ago to conduct joint development and test activities on lightRadio TD-LTE projects. The TDD lightRadio Metro Radio houses two of ALU's now-famous 'cubes' (highly compact radios which can be installed on lamp posts) integrated with a directional antenna. This enables a level of coverage which would normally require a far larger remote radio unit linked to an external antenna via cable, claimed ALU. China Mobile's first trial TD-LTE network using the lightRadio product covers 13 cities including Shanghai, Nanjing and Qingdao. 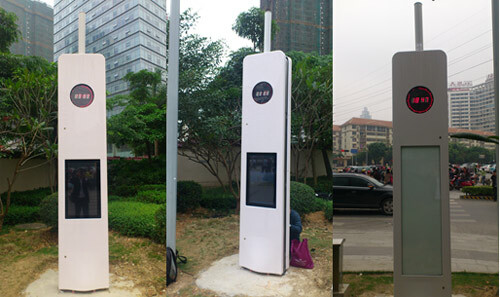 The base station will be deployed in busy indoor and outdoor locations, such as retail malls and sports stadia. 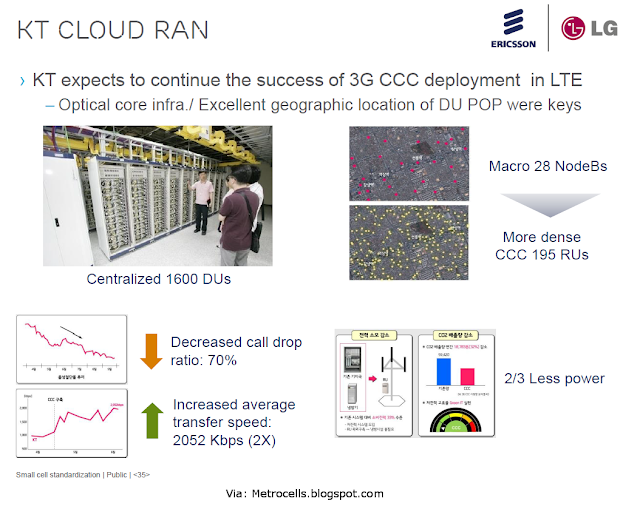 As well as C-RAN, Mobile also plans to deploy compact metrocells combining 3G, 4G and Wi-Fi on a massive scale in future. ASOCS Ltd., a Silicon IP provider of software defined radio solutions and CMRI, Research Institute of China Mobile (CMCC) Ltd., the world's largest mobile operator, have signed a strategic memorandum of understanding for the joint development, commercialization, testing and deployment of large-scale baseband processing units for China Mobile's next generation Cloud-RAN network. Earlier trials undertaken by leading mobile operators, identified the bottleneck of Centralized Base-band Units, consisting of general purpose CPU, to perform major baseband calculations in cost and power efficient management. The solution was to introduce significant offloading capabilities of such calculations with highly specialized Modem Processing Units (MPU). Today there is a growing understanding in the industry that such MPU should support a wide range of system partitioning, topologies and real time system performance, including large scale Collaborative Multi-point communications (COMP) and massive MIMO. Since communication algorithms are evolving over time, and since the C-RAN concept provisions on-the-fly reconfiguration of the BBU to support a variety of mobile communication standards, an MPU solution which is re-configurable at runtime has a great advantage over traditional hard-wired designs. China Mobile (CMCC) has been pushing the cloud agenda for a long time. A whitepaper from them on the same topic is available here. NTT DOCOMO, INC., Japan’s leading mobile operator and provider of integrated services centered on mobility, announced today it will begin developing high-capacity base stations built with advanced C-RAN architecture for DOCOMO’s coming next-generation LTE-Advanced (LTE-A) mobile system. The new architecture will enable quick, efficient deployment of base stations, especially in high-traffic areas such as train stations and large commercial facilities, for significantly improved data capacity and throughput. 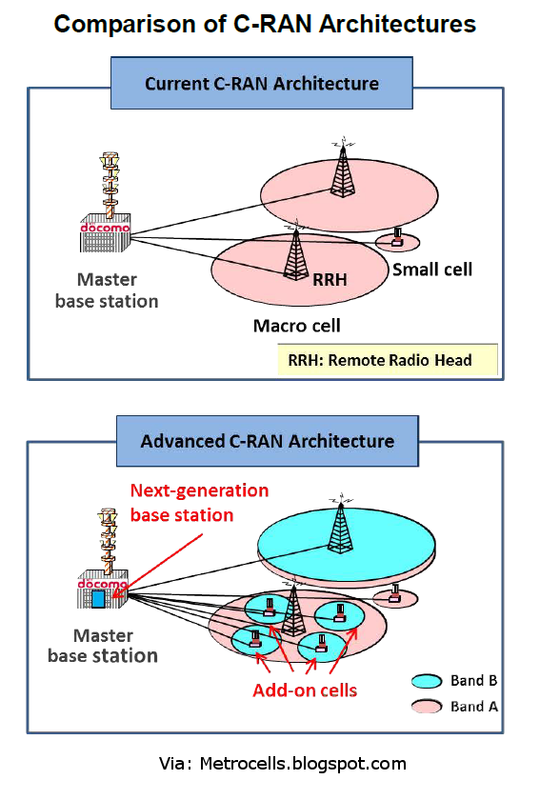 Advanced C-RAN architecture, a brand new concept proposed by DOCOMO, will enable small “add-on” cells for localized coverage to cooperate with macro cells that provide wider area coverage. This will be achieved with carrier aggregation technology, one of the main LTE-Advanced technologies standardized by the Third Generation Partnership Project (3GPP). The small add-on cells will significantly increase throughput and system capacity while maintaining mobility performance provided by the macro cell. High-capacity base stations utilizing advanced C-RAN architecture will serve as master base stations both for multiple macro cells covering broad areas and for add-on cells in smaller, high-traffic areas. The base stations will accommodate up to 48 macro and add-on cells at launch and even more later. Carrier aggregation will be supported for cells served by the same base station, enabling the flexible deployment of add-on cells. In addition, maximum downlink throughput will be extendible to 3Gbps, as specified by 3GPP standards. Japan's Docomo has selected the vendors, Nokia Siemens and Panasonic, which will upgrade its network with certain LTE-A features like carrier aggregation. This is a good win for NSN, which has not featured as heavily as Ericsson and Alcatel-Lucent in the most advanced LTE roll-outs to date. Breaking into the Japanese carriers is tough, since Docomo in particular tends to rely on trusted local suppliers with which it has long-standing development alliances. Panasonic, of course, falls into that category - it has worked with the operator since 2007 on LTE network infrastructure, but NSN was also brought into that project at an early stage and its efforts have borne fruit. The European vendor will supply its Liquid Radio multiple standard RAN. Like Docomo's LTE network, there will be heavy use of remote radio heads, with baseband processing virtualized in the cloud, as well as increasing roll-out of small cells to increase indoor and outdoor capacity. NSN says the base stations will deliver capacity of 300Mbps. In future, the two vendors will support Docomo's own particular definition of Cloud-RAN, a concept which is being pioneered in China, Japan and South Korea, and which takes the idea of remote radio heads and shared basebands to a new level. Docomo says it favors C-RAN because the cell site equipment, consisting of radio and antenna, is compact and low power, and so can be deployed quickly in high traffic areas like train stations. It calls its architecture Advanced C-RAN and this will rely on some HetNet principles, including a separate layer of 'add-on' small cells adding localized capacity while cooperating with macrocells. In the C-RAN, there will be high capacity master base stations supporting multiple macrocells plus the local small cells. The master BTSs will handle up to 48 macro and small cells at launch and more later. Carrier aggregation will be supported for cells served by the same base station. The carrier says it will boost peak downlink speed to 3Gbps over time, hitting 'true 4G' and 3GPP LTE-B standards. If you are wondering what 'LTE-B' or the 'true 4G' is, see this post here. In South Korea, both KT and SK Telecom have announced C-RAN strategies for their LTE deployments, dubbed Cloud Communications Center (CCC) and Smart Cloud Access Network (SCAN) respectively. As early as June 2011, SKT had deployed 1,772 RRHs and 609 baseband units within its LTE network in capital Seoul. The lower amount of baseband units suggests an average of almost three RRHs per baseband unit, assuming each RRH is single sector. The above two pictures are from the Small Cells Standardization presentation here. This is the central concept of C-RAN, deconstructing the traditional base station to leave a low power unit at the cell site, integrating antenna and radio, while centralizing all the baseband activity and supporting hundreds or thousands of sites flexibly from the cloud. 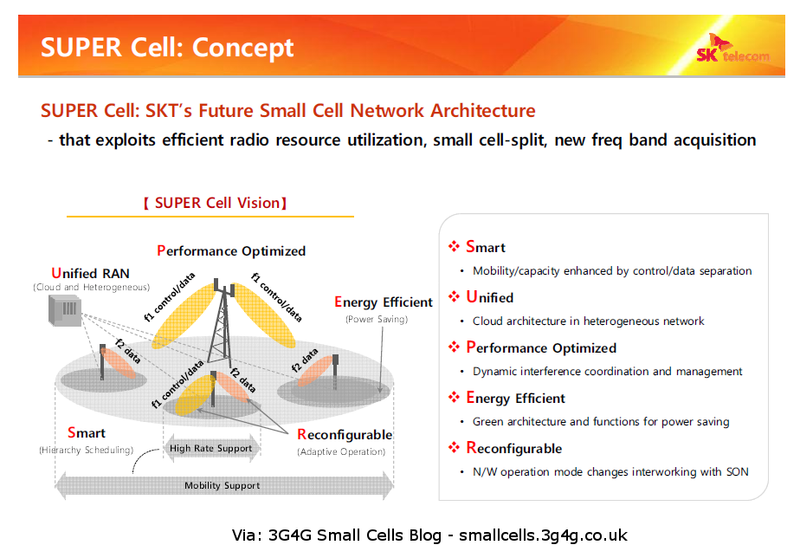 KT calls its LTE approach its Cloud Communications Center (CCC) architecture, and it has been co-developed with Samsung and Intel. The latter is leaping on the opportunity to bring its expertise in servers and data centers to the telco network, and in this case its platforms are integrated with Samsung modems to create a centralized exchange for signals communications processing. This is linked by fiber (essential for C-RAN) to the cell sites. As seen in vendor strategies like ALU's lightRadio and Nokia Siemens' Liquid Radio, the CCC also harnesses virtualization technology so that the central processing resources can be allocated flexibly according to the peaks and troughs of demand in different sites. Yung Kim, senior EVP head of strategy planning at KT, told TelecomAsia: "For example, at a sports stadium you can dynamically allocate more resources for that area during a game on a millisecond basis." The design also improves coverage at the cell edge, he added, claiming twice the capacity per cell, on average, because of better improved edge management. The CCC architecture can manage 144 base stations per server and accommodate 1,000 servers in each data center, all them acting as a central processing entity. Most tasks are run on off-the-shelf processors rather than dedicated ASICs, also a key trend to reduce the cost of data networks and to converge the norms of the IT data center with those of telecoms. 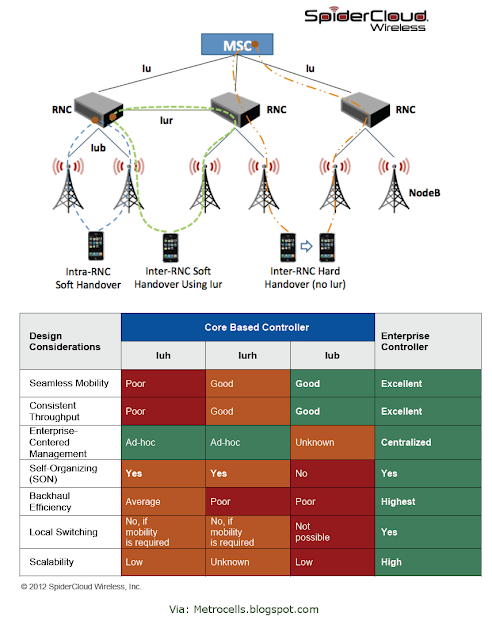 The performance and power advantages of modern computer processors are now up to the task of massive telecoms networks, believe carriers like KT, hence the intense interest of Intel, although some ARM-based chip vendors like Marvell and Freescale are also pushing from the network into the data center. Do you have an opinion on the C-RAN architectures in the future? If yes, we would like to hear.